It is such a masterful movie; serene, cheesy, serious, gory all at the same time. 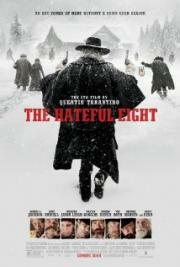 It shows a great level of maturity on Tarantino's side; this is my favorite movie of his. The acting is unreal (particularly Leigh and Jackson) and all that effort to shoot it with 70 mm really paid off. The scenery shots are just breathtaking and the music sublime. It was a shame that I didn't see it on the cinema. The score is for Tarantino doing well at being Tarantino and making the whole thing ooze with Tarantino-ness. And for Leigh, Russell and Goggins’ performance. The rest when unpackaged is a bumpy ride of pacing, script, acting and unsatisfying violence issues. I have a problem with a western setting for “coolness” factor when there is nothing that really keeps the screenplay from being transported to another time. Like the violence, they both have more impact when they have more purpose. Feb 10 Iulius E. S.